It is hard to know what an artist had in mind when creating an artwork but, still, we can’t resist the excitement of using our imagination and guesswork to find out more about the background of our favourite artefacts. 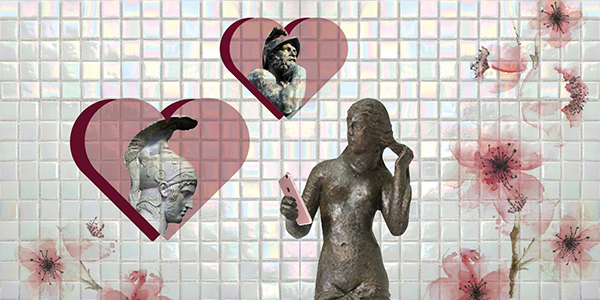 Here below, you will discover two Aphrodite statuettes revealing two stories of love and lust. Aphrodite is known to be the goddess of beauty, love, desire, marriage and family. Representations of Aphrodite are usually encountered in statues and statuettes of various forms and sizes. Her figure is imprinted in our mind emerging out of a shell and bathing carefree, wearing only a few drops of her favourite perfume, just like an ancient Marilyn Monroe. Aphrodite is bathing, half-naked. On her right hand, she holds a little mirror- now lost- while with her left hand she gently touches her hair. She seems to be preoccupied with her hairstyle. She might be pampering herself before visiting Ares, her secret lover. You see, Aphrodite was married to Hephaestus, the god of metallurgy and fire, who was considered to be the ugliest among the twelve Olympian gods. Ares, on the other hand, was handsome and well-built, as he was the god of war and proved to be a far more suitable partner for the goddess of beauty. While Hephaestus was absent working in his workshop, Aphrodite would keep their marital bed warm making love to Ares. Just to be on the safe side, Ares had someone staking out their love nest in case Hephaestus returned home. One day his guard, though, fell asleep and the Sun rose in the sky while the lovers were still in bed. Facing the sight of the lustful couple, the Sun informed Hephaestus about the affair. Hephaestus sought for revenge and designed a scheme so as to catch them red-handed. He made a net and placed it above his bed. So when the following day Aphrodite and Ares went to bed, they got trapped and Hephaestus invited all the gods to come and see his unfaithful wife and her lover. Driven by fury, Ares punished his guard turning him into a rooster, cursed to wake up first while everyone is still asleep and announce the beginning of the new day. 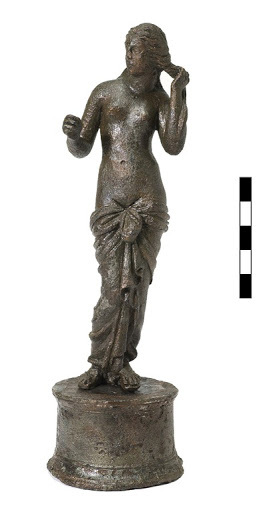 Bronze Aphrodite statuette, 3rd century AD, Ancient Agora Museum, B 881. 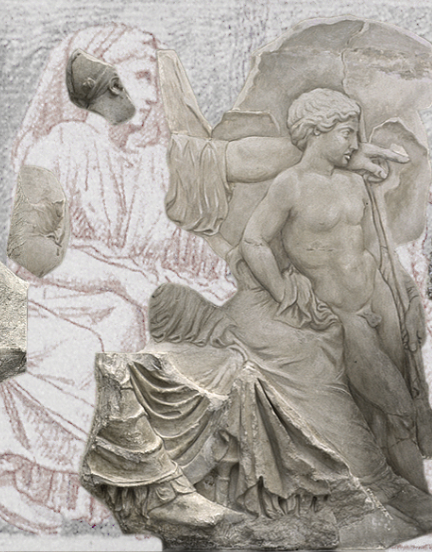 Aphrodite is represented, quite surprisingly fully dressed, seated with her hand on the shoulder of her son, Cupid, pointing to somewhere in front of them. The scene should be taken from the Panathenaic procession, the grand celebration of Ancient Athens, which was held at the height of summer, around the 21st of July. I guess Aphrodite is scrutinizing the marching crowd to detect among the girls her former rivals and punish them accordingly using the help of her son! Nevertheless, should you walk along the 160 meters of the Parthenon frieze, you will see only 149 human figures, a procession of everyday people, chariots, priests, and gods. In fact, the actual procession was much longer, as the entire city would take part in the grand celebration, but Phidias, the sculptor who created this magnificent sculptural design, had limited available space and had to be selective. Thus, he forgot to include in his sculptural decoration the representation of poor Eos, the personification of the dawn. Aphrodite was furious with Eos because Ares had fallen in love with her. She cursed her to live the rest of her life in a futile quest of true love. She had multiple lovers and gave birth to many children but never managed to find the ideal partner who would live up to her expectations.